Take a look inside mission control at the Johns Hopkins Applied Physics Laboratory as the Van Allen Probes perform the final orbital maneuver of their mission. NASA and APL experts answered questions about the mission, and discussed what we've learned - and what we hope to discover - as a result of the Van Allen Probes' final phase of exploration. On February 12, the Van Allen Probes mission operations team at APL – where the probes were designed and built – began a series of orbit descent maneuvers. Two tough, resilient NASA spacecraft have been orbiting Earth for the past six and a half years, flying repeatedly through a hazardous zone of charged particles known as the Van Allen radiation belts. A new article looks at the strange, otherworldly "whistler waves" and “chorus” captured by the probes' Electric and Magnetic Field Instrument Suite and Integrated Science (EMFISIS). Humans have long been shaping Earth’s landscape, but now scientists know we can shape our near-space environment as well. A certain type of communications — very low frequency, or VLF, radio communications — have been found to interact with particles in space, affecting how and where they move. Earth's radiation belts, two doughnut-shaped regions of charged particles encircling our planet, were discovered more than 50 years ago, but their behavior is still not completely understood. Now, new observations from NASA's Van Allen Probes mission show that the fastest, most energetic electrons in the inner radiation belt are not present as much of the time as previously thought. New findings based on a year's worth of observations have revealed that the ring current - an electrical current carried by energetic ions that encircles our planet - behaves in a much different way than previously understood. PC Mag asks: "We have warning systems for hurricanes and tornadoes, so why not have the same for bad weather in space?" The article highlights a portion of the Van Allen team's space weather research. A new article by the Van Allen Probes team in EOS magazine looks at the extended mission and how it will continue to advance understanding of Earth's radiation belts. The shape of the two Van Allen Belts could be quite different than has been believed for decades, according to a new study of data from NASA's Van Allen Probes that was released Friday in the Journal of Geophysical Research. A new study of data from NASA's Van Allen Probes reveals that the shape of the belts can vary from a single, continuous belt with no slot region, to a larger inner belt with a smaller outer belt, to no inner belt at all. The probes have collected groundbreaking data on the two radiation belts that surround Earth and have revealed intriguing new details on the sun's influence on our planet. NASA and the Brazilian Space Agency (AEB) have signed agreements to further research into heliophysics and space weather. The agreements will also enable Brazil to acquire and process space weather data from NASA's Van Allen Probes. Scientists at MIT's Haystack Observatory and elsewhere have analyzed data from NASA's Van Allen Probes, and observed a sudden and dramatic effect in the aftermath of a solar shockwave: The resulting magnetosonic pulse accelerated certain particles to ultrahigh energies. After lifting off on August 30, 2012, the twin probes have delivered a wealth of data that has resulted in numerous discoveries, all of which have increased our understanding of these fascinating regions of space. The twin Van Allen Probes will celebrate on Saturday two years of studying the sun's influence on our planet and near-Earth space. One of the great, unanswered questions for space weather scientists is just what creates the radiation belts. Recent data from the Van Allen Probes address this question. On March 26, 2014, NASA declared the Van Allen Probes mission - launched in 2012, and designed to explore and unlock the mysteries of Earth's radiation belts - an official success. Scientists have discovered a new, persistent structure in Earth's inner radiation belt using data from the twin NASA Van Allen Probes spacecraft. Most surprisingly, this structure is produced by the slow rotation of Earth. Using data from the Van Allen Probes, researchers have tested and improved a model to help forecast what's happening in the radiation environment of near-Earth space. New research using data from NASA’s Van Allen Probes mission helps resolve decades of scientific uncertainty over the origin of ultra-relativistic electrons in the Earth’s near space environment, and is likely to influence our understanding of planetary magnetospheres throughout the universe. In the already complicated science of what creates - and causes constant change in - the radiation belts surrounding Earth, researchers have announced that some of the electrons reach such enormous energies that they are driven by an entirely different set of physical processes. NASA's Van Allen Probes launched on Aug. 30, 2012 on a mission to unlock the mysteries of the Van Allen radiation belts. Their first year has resulted in surprise discoveries and better understanding of this mysterious and hazardous region of space. The sun's global magnetic field is about to flip, a sign that Solar Max has arrived – and the Van Allen Probes will help answer how this event will affect space weather and the radiation belts. Scientists have discovered a massive particle accelerator in the heart of one of the harshest regions of near-Earth space, a region of super-energetic, charged particles surrounding the globe called the Van Allen radiation belts. June 21, 2013: How did a third radiation belt appear in the Earth's upper atmosphere? In new research, the radiation belt group in the UCLA Department of Atmospheric and Oceanic Sciences explains the development of the newly-discovered third belt and its decay over a period of slightly more than four weeks. 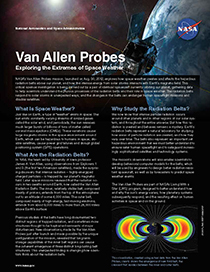 New versions of the Van Allen Probes fact sheet—including information about the discovery of a temporary third radiation belt—are now available in both high- and low-resolution. Live tweets from the presentations on space weather at the 2013 Space Weather Enterprise Forum, held at the National Oceanic and Atmospheric Administration on June 4, 2013. Learn how Dartmouth physicists Mary Hudson and Robyn Millan are studying the Van Allen radiation belts with data from NASA's Van Allen Probes and from balloons launched from Antarctica in this "Darthmouth Now" feature article. NASA will hold a news conference at 2 p.m. EST, Thursday, Feb. 28, to discuss new observations from NASA's twin Van Allen Probes, which are studying Earth's radiation belts. The briefing will be held at the Johns Hopkins University Applied Physics Laboratory in Laurel, Md. See new footage and learn more about NASA's Van Allen Probes mission - and other stories of amazing scientific exploration - in the "National Geographic at 125" special airing on the National Geographic Channel. Just 96 days since their launch, the Van Allen Probes have already provided new insights into the structure and behavior of the radiation belts that surround Earth. The presentations from "New Findings, New Enigmas: NASA's Van Allen Probes Begin their Exploration of the Radiation Belts," given on Dec. 4 2012, are now available for download. Scientists from NASA's Van Allen Probes mission will discuss some of their first findings at the American Geophysical Union (AGU) 2012 Fall Meeting in San Francisco, Ca. on Tue., Dec. 4 at 8:00 a.m. PST. NASA has officially renamed the recently launched mission to study Earth's radiation belts the Van Allen Probes, in honor of the late James Van Allen. A ceremony to announce the renaming of NASA's Radiation Belt Storm Probes (RBSP) will take place Nov. 9 from 2 p.m. to 3:30 pm EST, at the Johns Hopkins University Applied Physics Laboratory (APL) in Laurel, Md. On Oct. 28, NASA's twin Radiation Belt Storm Probes (RBSP) completed their 60-day commissioning phase, and began their two-year primary science mission to explore our planet's radiation belts, named for their discoverer, James Van Allen. Today marks the 54th anniversary of the launch of NASA's first spacecraft, Pioneer 1, which (along with Pioneer 3) provided data from near-Earth space that contributed to James Van Allen's first characterization of the structure of the inner radiation belt. See a pre-launch photo here and learn more here. RBSP has begun its 60-day commissioning phase of operations, where all of the spacecrafts' systems and instruments are activated, monitored, and made ready for the two-year primary science mission. On this day in 1914, James A. Van Allen was born in Mount Pleasant, Iowa. To learn about the life and legacy of the man who led the team that discovered Earth's radiation belts, visit the University of Iowa's excellent compendium of materials here. Two NASA TV videos feature the launch and deployment of the RBSP spacecraft, and a post-launch press conference covering the successful launch and initial operations of the twin probes. NASA's Radiation Belt Storm Probes (RBSP), the first twin-spacecraft mission designed to explore our planet's radiation belts, launched into the predawn skies at 4:05 a.m. EDT from Cape Canaveral Air Force Station, Fla.
At 4:05 a.m. EDT today, NASA launched the twin RBSP spacecraft from Launch Complex-41 at Cape Canaveral Air Force Station. The roll-out of the mobile launch platform carrying the Atlas V rocket and the twin RBSP spacecraft has been scheduled for 2:30 p.m. EDT on Tuesday, Aug. 28. This will bring the launch vehicle out of the Vehicle Integration Facility and to the launch pad at Launch Complex-41, Cape Canaveral Air Force Station. RBSP is scheduled to launch at 4:05 a.m. EDT on Thursday, Aug. 30. The launch of an Atlas V carrying NASA's Radiation Belt Storm Probes (RBSP) payload was scrubbed today due to weather conditions associated with lightning, as well as cumulus and anvil clouds. With the unfavorable weather forecast as a result of Tropical Storm Isaac, the leadership team has decided to roll the Atlas V vehicle back to the Vertical Integration Facility to ensure the launch vehicle and twin RBSP spacecraft are secured and protected from inclement weather. Pending approval from the range, the launch is rescheduled to Thursday, Aug. 30 at 4:05 a.m. Eastern Daylight Time. Because of weather rule violations, managers have halted today's attempted launch of the Atlas V rocket carrying NASA's Radiation Belt Storm Probes. The launch team is resetting for a 24-hour recycle. Liftoff on Sunday would occur at 4:07 a.m. EDT at the start of a 20-minute launch window. There is a 40 percent chance of acceptable weather for Sunday. Numerous weather violations resulted in the scrub of today's planned launch of the Radiation Belt Storm Probes. Details about rescheduling will be posted when available. CAPE CANAVERAL--NASA launch managers have rescheduled liftoff of the United Launch Alliance Atlas V/Radiation Belt Storm Probes mission from Cape Canaveral Air Force Station's Space Launch Complex-41 for 4:07 a.m. EDT Saturday at the start of a 20-minute launch window. The decision followed a series of meetings to evaluate "out-of-family" readings in the signal of a C-Band tracking device linking the Atlas V rocket and ground-based range equipment that caused a scrub early Friday morning. The C-Band Transponder is one of several systems used to track the vehicle after launch for range safety purposes. Join us for live countdown coverage starting at 2:30 a.m. NASA TV will feature full televised coverage at http://www.nasa.gov/nasatv while blogger Steve Siceloff provides updates from the Launch Vehicle Data Center on NASA's Launch Blog at http://www.nasa.gov/mission_pages/rbsp/launch/launch_blog.html. Friday's planned launch of NASA's Radiation Belt Storm Probes (RBSP) was delayed at least 24 hours when the Eastern Range reported a drift in the signal of a C-Band transponder aboard the Atlas V rocket. It is not yet known if the issue was in the ground-based range detection equipment or in the Atlas V transponder.The C-Band is one of several systems used to track the vehicle after launch, and it is mandatory for it to operate prior to liftoff. Because of the limited 20-minute launch window, the launch team was not able to determine the cause of the signal drift before the window expired. Managers have set up for a 24-hour recycle, pending clearance of the issue. Launch is targeted for the opening of a 20-minute launch window at 4:07 a.m. EDT on Saturday.At this time, the Atlas rocket is being safed and propellants removed. When those operations are complete, C-Band beacon troubleshooting will begin. If the issue is found to be on the Atlas transponder, it may be necessary to replace the hardware.NASA and United Launch Alliance managers will know more within a few hours, after the troubleshooting has been completed. Tomorrow's launch window opens at 4:07 a.m. EDT for 20 minutes, same as today's. Details will be posted as they become available. CAPE CANAVERAL--The Atlas V first stage and Centaur upper stage have been fueled for the planned launch at 4:07 a.m. EDT of NASA's Radiation Belt Storm Probes (RBSP). The Atlas V burns refined kerosene fuel, known as RP-1, mixed with liquid oxygen. The Centaur uses liquid hydrogen for fuel, mixed with liquid oxygen. The Centaur will ignite after the Atlas V first stage burns its propellants and falls away, about four minutes after liftoff. Weather continues to be favorable and there are no technical problems. At 3:38 a.m., the countdown will hold at the T-4 minute mark for 25 minutes. NASA's two-year Radiation Belt Storm Probes mission is slated to begin early Friday morning with a ride to orbit aboard the United Launch Alliance Atlas V rocket. Liftoff from Cape Canaveral Air Force Station's Space Launch Complex-41 is set for 4:07 a.m. EDT at the start of a 20-minute launch window. Join us for live countdown coverage starting at 1:30 a.m. NASA TV will feature full televised coverage at http://www.nasa.gov/nasatv while blogger Steve Siceloff provides updates from the Launch Vehicle Data Center on NASA's Launch Blog at http://www.nasa.gov/mission_pages/rbsp/launch/launch_blog.html. At Space Launch Complex-41 on Cape Canaveral Air Force Station in Florida, there is relatively minor activity at the pad today as personnel rest for the overnight countdown to liftoff of NASA's Radiation Belt Storm Probes. Countdown preparations will begin tonight at 8:52 p.m. EDT. The weather forecast continues to reflect a 70 percent chance of meeting the launch weather criteria.Note: Live coverage of the RBSP launch will begin on NASA TV at 1:30 a.m. EDT on Friday, Aug. 24. Opportunities for D.C/Baltimore local media to watch APL mission control operations for RBSP launch. The rollout of the Atlas V rocket with NASA's Radiation Belt Storm Probes spacecraft began on schedule at 8 a.m. EDT, reaching the pad at Space Launch Complex-41 at 8:35 a.m. The launch weather forecast has improved to a 70 percent chance of meeting the weather criteria for liftoff. For the upcoming launch of NASA's Radiation Belt Storm Probes, testing of the Atlas V RD180 booster engine actuator was completed last night at Cape Canaveral Air Force Station in Florida. The launch of RBSP aboard an Atlas V rocket has been rescheduled for 4:07 a.m. EDT on Friday, Aug. 24, to allow for an assessment of the launch vehicle rocket. More details will be provided as they become available. The official RBSP Press Kit is now available for download. NASA's Radiation Belt Storm Probes (RBSP) mission will send two spacecraft into the harsh environment of our planet's radiation belts. Final preparations have begun for launch on Thursday, Aug. 23, from Florida's Space Coast. NASA will hold a news conference at 2 pm EDT, Thursday, Aug. 9 to discuss the upcoming launch of the Radiation Belt Storm Probes (RBSP), a mission to study Earth's radiation belts. The event will be broadcast live on NASA Television and streamed on the agency's website. In three new time-compressed videos (note: no sound), the July 5 deployments of one of RBSP spacecraft A's solar arrays, and the attached Electric and Magnetic Field Instrument Suite and Integrated Science (EMFISIS) magnetometer boom, are tested. NASA's Radiation Belt Storm Probes (RBSP) mission continues to make steady progress toward its scheduled launch date of Thursday, Aug. 23, 2012. The twin Radiation Belt Storm Probes (RBSP) safely arrived at 7:54 a.m. EDT on May 1 at the Kennedy Space Center, Fla., where they are scheduled for an August 23 launch to begin their mission to study the extremes of space weather. NASA's Radiation Belt Storm Probes have completed their thermal vacuum testing today, Tuesday April 3, one day earlier than planned. Thermal vacuum testing, which includes the cycling of temperatures between extremes of hot and cold, represents the culmination of the several severe tests that the spacecraft engineers use to assure that the spacecraft can survive the rigors of outer space. With the integration and testing of NASA's Radiation Belt Storm Probes complete, and the twin spacecraft sealed within thermal vacuum testing chambers for six weeks of rigorous space environment simulation, another part of the RBSP team is busy ensuring that the spacecraft will successfully perform their science gathering mission after launch in August 2012. NASA's Radiation Belt Storm Probes (RBSP), twin spacecraft being built and tested at the Johns Hopkins University Applied Physics Laboratory in Laurel, Md., are about to enter a challenging series of tests designed to certify that they are ready for their August 2012 launch and two-year mission in Earth's orbit. The coordinated measurements of the two RBSP spacecraft will advance our understanding of space weather and the sun's influence on the Earth and near-Earth space by probing the planet's radiation belts, which affect space weather and spacecraft operations. NASA's RBSP mission recently made another significant step forward toward its scheduled launch in August 2012, thanks to the successful testing of the mass properties of spacecraft A by the RBSP team at the Johns Hopkins Applied Physics Laboratory (APL). A behind the scenes look at the Van Allen Probes mission. The Van Allen Probes team at the Johns Hopkins University Applied Physics Laboratory (APL) has created a visualization that provides a way to "watch" today's fly-by of NASA's Juno spacecraft and the current space weather above Earth. For years, APL's Christina Hammock created complex scientific instruments bound for space. Now, as one of eight new NASA astronaut candidates, she has her own chance to explore the stars. Watch video of the Nov. 9 event at which NASA renamed the recently launched mission to study Earth's radiation belts the Van Allen Probes, in honor of the late James Van Allen. November 15, 2012: In The Loop: "The Van Allen Probes: Honoring the Origins of Magnetospheric Science"
A new NASA article explores the history of radiation belt research and James Van Allen, and explores the theories that the Van Allen Probes will help scientists investigate. Can you use simple graphing techniques, a compass, and the Pythagorean Theorem to roughly triangulate the position of the "chorus" sounds above our Earth? RBSP's scientists are doing similar work as they study these mysterious, bird-like noises in the Van Allen radiation belts. Try the Science Math @ NASA problems here. On Wed., Oct 3, the doors to both Helium Oxygen Proton Electron (HOPE) instruments (one of the three instruments that make up the Energetic Particle, Composition, and Thermal Plasma Suite, or ECT) were opened on the twin RBSP spacecraft. Software has been loaded onto several other instruments, and all of the science instrument teams are busy making adjustments and fine-tuning their instruments as the mission continues to proceed. October 2, 2012: In The Loop: News from NASA Science as RBSP Records "Earthsong"
RBSP has provided researchers with the clearest recording ever made of an electromagnetic phenomenon known as "chorus," which is "thought to be one of the most important waves for energizing the electrons that make up the outer radiation belt," says EMFISIS Principal Investigator Craig Kletzing. Read the NASA Science article here. Just under two days after the 4:05 a.m. EDT launch of RBSP, an instrument from the Energetic Particle, Composition, and Thermal Plasma Suite (ECT) began returning "highly understandable, full science data right out of the box." Researchers from the EMFISIS team at the University of Iowa have released a new recording of an intriguing and well-known phenomenon known as "chorus," made on Sept. 5, 2012. The Johns Hopkins Applied Physics Laboratory hosted a workshop earlier this month that drew teachers and educators from almost half the states to learn about the mission first-hand from the engineers and scientists who designed it. NASA needed two tough spacecraft equipped with the best instrumentation ever flown into the hazardous radiation belts. Building those RBSP spacecraft with enough protection and flexibility to survive the belts was the challenge that faced the team at the Johns Hopkins Applied Physics Laboratory in Laurel, Md. One of the most powerful photos of RBSP prior to launch is this stunning image of the spacecraft and their Atlas V launch vehicle as a storm approaches, taken after the first roll out on Aug. 22, 2012 at Cape Canaveral Air Force Station Launch Complex-41. Giving scientists the data they need to understand how the radiation belts change and operate is RBSP's primary science goal. But just what are the radiation belts? Check out this new video that explains the mysterious belts of highly-charged particles that surround our planet. On Monday, August 6, the RBSP stacked spacecraft were encapsulated with the fairing in which they will ride atop the ULA Atlas V 401 launch vehicle. On Thursday, Aug. 2, NASA Administrator Charles Bolden and Kennedy Space Center Director Robert Cabana met with the Radiation Belt Storm Probes team and visited the stacked spacecraft. When RBSP technician Alan Busbey, working in Florida, was asked to speak to his son's fifth-grade class - located 900 miles away - about his work this May, he had to get creative. 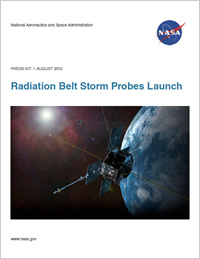 Get the latest information on NASA's Radiation Belt Storm Probes mission with the new RBSP Fact Sheet, available here. We've just added more than 40 new interviews to our "Conversations With the Team" interactive Q&A page. July 18, 2012: In the Loop: "The Electric Atmosphere: Plasma Is Next NASA Science Target"
Two giant donuts of plasma surround Earth, trapped within a region known as the Van Allen radiation belts. RBSP will improve our understanding of what makes plasma move in and out of these electrified belts. The 50th anniversary of the launch of the Telstar I satellite - which was eventually damaged by radiation from the Van Allen belts - will be celebrated with a series of speakers including Louis Lanzerotti, Principal Investigator for the Radiation Belt Storm Probes Ion Composition Experiment (RBSPICE). With less than 50 days until scheduled launch on August 23, 2012, the RBSP team is hard at work preparing the spacecraft - but they did take a few minutes to pose for a holiday photo. NASA will host a two-day event for 50 social media followers on August 22-23, 2012, at NASA's Kennedy Space Center in Florida. On Monday, June 25, National Public Radio's "All Things Considered" program broadcast a feature story about the Radiation Belt Storm Probes mission. A new compilation video highlights some of the lengthy and rigorous testing that NASA's twin Radiation Belt Storm Probe spacecraft underwent at APL prior to shipping to the Kennedy Space Center on May 1, 2012. The voyage of NASA's twin Radiation Belt Storm Probes from APL to the Kennedy Space Center can be retraced in a new photo gallery. NASA's twin Radiation Belt Storm Probes have been removed from the protective containers that carried them safely to the Kennedy Space Center. NASA's twin RBSP spacecraft are getting ready for the voyage from the Johns Hopkins Applied Physics Laboratory to the Kennedy Space Center, scheduled for May 1. April 16, 2012: April 16, 2012: New NASA videos explain "Mysteries of the Sun"
NASA has just released five new videos that look at the Sun's influence throughout the solar system and its connection to the Earth and the Earth's extended space environment-key areas of exploration for the Radiation Belt Storm Probes. As NASA's twin Radiation Belt Storm Probe spacecraft prepare to leave APL for the Kennedy Space Center, a new launch date of Thursday, August 23, 2012 has been announced. This one-minute video, taken on Feb. 21, is a compressed version of the loading of NASA's twin Radiation Belt Storm Probe satellites into two identical thermal vacuum testing chambers. On Feb. 21, NASA's twin RBSP satellites were carefully raised and sealed into two identical thermal vacuum testing chambers. Filled with electrons and energetic charged particles, Earth's Van Allen radiation belts swell and shrink in response to incoming solar energy, but no one is quite sure how. NASA's twin RBSP satellites will depend on their solar panels for power during their two-year orbit of Earth; recent tests made sure they would deploy correctly. The Radiation Belt Storm Probe satellites recently underwent successful acoustic testing at the center of a tower of special loudspeakers. Enhance your desktop with four new wallpapers featuring the RBSP spacecraft, in both full screen and wide screen formats. On Oct. 28, more than 100 students from three Maryland public middle schools made a trip to APL to find out about NASA's Radiation Belt Storm Probes mission. Both RBSP spacecraft are now equipped with Integrated Electronics Modules (IEMs), which contain radiation-hardened processors and allow subsystems and instruments on the spacecraft to exchange data. The RBSP team marks a development milestone amid a flurry of instrument activities. With the first mission simulation just about a month away, let's check in on RBSP spacecraft work. "New Findings, New Enigmas: NASA's Van Allen Probes Begin their Exploration of the Radiation Belts"
Media from this event is available in high resolution at http://svs.gsfc.nasa.gov/vis/a010000/a011000/a011027/. Alpha particle An alpha particle is a type of particle radiation that is made up of two protons and two neutrons bound together. It is identical to the nucleus of the element helium. 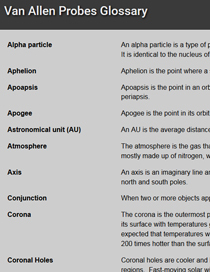 Aphelion Aphelion is the point where a satellite (natural or human-made) is farthest from the sun in its orbit. Apoapsis Apoapsis is the point in an orbit when two objects are farthest apart. When they are closest together it is called periapsis. Apogee Apogee is the point in its orbit where a satellite (natural or human-made) is farthest from Earth. Astronomical unit (AU) An AU is the average distance from Earth to the sun, about 93 million miles, or 150 million kilometers. Atmosphere The atmosphere is the gas that surrounds a planet or star, and is held in place by gravity. Earth's atmosphere is mostly made up of nitrogen, while the sun's atmosphere consists mainly of hydrogen. Axis An axis is an imaginary line around which something rotates. The Earth’s axis for instance, passes through the north and south poles. Conjunction When two or more objects appear near one another in the sky, it is said that they are in conjunction. Corona The corona is the outermost part of a star’s atmosphere. The sun’s corona extends millions of kilometers from its surface with temperatures greater than a million degrees. This is fascinating to scientists because it would be expected that temperatures would drop as the distance from the sun’s core increases, yet the corona is about 200 times hotter than the surface. Coronal Holes Coronal holes are cooler and less dense areas in the sun’s corona, and they appear darker than surrounding regions. Fast-moving solar wind is known to come from coronal holes. Coronal Mass Ejections A coronal mass ejection, or CME, is a huge eruption on the surface of the sun that releases billions of tons of plasma with tremendous force. It is one of the biggest explosions in our solar system. The high-energy, high-speed particle radiation that is released during a CME can damage satellites, cause power outages on Earth, and create serious health concerns for astronauts. Cosmic rays Atomic nuclei (mostly protons) and electrons that crash into Earth's atmosphere with exceedingly high energies are called cosmic rays. Cyclotron A cyclotron is a circular machine that is used to accelerate charged particles to extremely high energies. It uses a magnetic field to bend the path of the particles so they move in a circle, repeatedly passing over plates whose charges switch back and forth from positive to negative—these alternating charges accelerate the particles. The high-energy particles collide with other particles, breaking them apart to reveal even smaller elementary particles within them. Dipolar The prefix “di-” means “two” or “double”, therefore dipolar means two or double poles. It refers to a magnetic field or electric field that has two equal and opposite points where the lines of force are most concentrated. Bar magnets, Earth, and the sun all have dipolar magnetic fields. Density Density refers to the amount of mass (“stuff”) in a certain space or volume. For example, an elevator with 12 people inside would have a greater density of people than the same elevator with only 2 passengers. Electromagnetic radiation Electromagnetic radiation or electromagnetic waves are produced by the motion of electrically charged particles. Radio waves, microwaves, visible light, and x-rays are all examples of electromagnetic radiation. Electron An electron is a negatively charged particle that orbits an atom’s nucleus. Electrons can be knocked out of their orbits through collisions with other particles or with electromagnetic radiation. Once free of their atoms, they can join other atoms or remain as free negative charges. Electron volt (eV) An electron volt is a unit of energy commonly used in particle physics. As an electron is pulled or pushed by Earth's magnetic field, its energy changes. We measure the amount of energy that an electron gains or loses in electron volts. An electron volt is a very tiny unit (1.6 × 10-19 Joules). For large energy changes, scientists may use kilo-electron volts (keV) which are equal to 1000 electron volts, or mega-electron volts (MeV) which are equal to 1,000,000 electron volts. Flux Flux is how quickly a certain amount of something such as energy, particles, or a volume of fluid moves through a certain area in a certain amount of time. Flux also refers to the strength of a magnetic or electric field in a given area. Geospace The prefix “geo-” is from Greek and means “Earth,” therefore, geospace is the region of space that surrounds Earth. Geospace extends from Earth’s upper atmosphere to the limits of its magnetic field. Geomagnetic storm A geomagnetic storm is a disturbance in Earth’s magnetosphere, caused by a solar event such as a flare or coronal mass ejection. Ion An ion is an atom or group of atoms that have a positive or negative electric charge. If the atom gains an electron it becomes a negatively charged ion. If the atom loses an electron it becomes a positively charged ion. Magnetic field The area around an object or an electric current where magnetism can be detected is called the magnetic field. Like bar magnets, both Earth and the sun have dipolar magnetic fields. The Earth’s magnetic field is very important because it helps to shield us from the harsh solar wind, solar flares, and coronal mass ejections. Magnetic field lines Magnetic field lines show the structure of a magnetic field. To see the field lines of a magnet, place a piece of paper over a magnet, then sprinkle iron filings on the paper. The iron will line up along the magnetic field lines. If you could do the same to the entire planet, you would see a similar pattern of field lines. Magnetometer A magnetometer is an instrument that detects the strength and direction of magnetic force. Magnetopause The magnetopause is the boundary between Earth’s magnetosphere and the solar wind. Magnetosphere The magnetosphere is the area of space around Earth that is influenced by the planet’s magnetic field. It traps charged particles from the sun and carves out a protective space in the solar wind. Magnetotail The magnetotail is the part of the magnetosphere that is pushed away from Earth by the solar wind. Matter Matter is any substance that has mass and takes up space. Physical objects are composed of matter in the form of atoms, which are made up of smaller particles called protons, neutrons, and electrons. Nucleus The nucleus is the core of an atom. It is made of positively charged protons, and neutrons which have no charge. The nucleus makes up most of the mass of an atom. Particle radiation Particle radiation is energy given off by fast-moving subatomic (smaller than an atom) particles like electrons or protons. While particle radiation from space usually doesn’t reach Earth’s surface, it can be dangerous for astronauts and can damage satellites. Periapsis Periapsis is the point in an orbit when two objects are closest together. It is the opposite of apoapsis. Perigee Perigee is the point in its orbit where a satellite (natural or human-made) is closest to Earth. Perihelion Perihelion is the point in its orbit where a satellite (natural or human-made) is closest to the sun. Plasma Plasma is a fourth state of matter distinct from solid, liquid, or gas and is present in places such as stars and lightening. Plasma is made of free electrons and ions, (atoms that have an electric charge because they have lost or gained electrons). When enough energy is added to atoms, they can begin to move quickly and collide with one another with enough force to knock electrons free. Proton Protons are positively charged particles that, along with neutrons, form the core or nucleus of an atom. The number of protons in an atomic nucleus is what distinguishes one element from another. Radiation Radiation refers to energy in the form of particles or waves. Some examples of radiation include visible light and x-rays. See the definitions of “electromagnetic radiation” and “particle radiation” for more detailed information. Radiation belts The radiation belts are two donut-shaped regions encircling Earth where high-energy electrons and ions are trapped by Earth’s magnetic field. They are often referred to as the “Van Allen Belts” because they were discovered by James Van Allen and his team at the University of Iowa, in 1958. Relativistic Relativistic refers to something moving at a velocity approaching the speed of light. Ring current The electric current made up of electrons and ions that encircle Earth is known as the ring current. It flows clockwise around the equator when viewed from the north. Satellite An object that orbits around a larger astronomical object is a satellite. It can refer to a natural object such as a moon orbiting a planet, or it can refer to a human-made object, such as a spacecraft put into orbit around the Earth to relay communications signals or transmit scientific data. Solar flare A solar flare is a violent eruption in the sun’s atmosphere that heats plasma and sends large amounts of solar particles hurtling into space at tremendous speeds. Solar minimum and maximum The period when the sun is most active with solar flares, sun spots, and coronal mass ejections, is known as the solar maximum. The solar minimum occurs when the sun is least active. The sun’s activity level is on an 11-year cycle. Solar wind The solar wind is a constant stream of plasma flowing from the surface of the sun. Other stars have stellar winds too. The winds are strongest near the end of the star’s life, when it has consumed most of its fuel. South Atlantic Anomaly (or SAA) The SAA is a region over the South Atlantic Ocean where the inner Van Allen radiation belt comes closest to Earth's surface. The SAA is produced by a dip in Earth's magnetic field at that location. The excess energy in this region presents a problem for satellites whose orbits take them through it, exposing them to several minutes of strong radiation each time. The International Space Station required extra shielding to deal with this problem and the Hubble Space Telescope does not take observations while passing through this region. Spectrum (plural - spectra) In general terms, a spectrum is a continuous sequence or range of something. A familiar example of a spectrum of visible light is a rainbow. Spectrometer A spectrometer is a tool that is used to measure and record the spectrum, or range, of light (or sometimes particles) coming from a particular source. Spectroscopy Spectroscopy is the use of light to study matter. Light is emitted, reflected, or absorbed differently by different types of matter. Almost like a fingerprint, each type of matter has a signature pattern in the way it gives off, reflects, or absorbs light. By using a spectrometer to study the spectra or range of wavelengths of light, a scientist can learn something about an objects motion, composition, temperature, and more, even if they can’t examine the object up close. For example, spectroscopy might be used to study what elements are present in a star millions of kilometers away. Vacuum A vacuum is space that is empty, or nearly empty, of all matter. Van Allen Dr. James Van Allen and his team at the University of Iowa discovered the Earth’s radiation belts in 1958. This scientific discovery was a first for the space-age. Velocity Velocity is the speed and direction of a moving object. Join the Van Allen Probes eNews list to receive updates about the mission. If you no longer wish to receive Van Allen Probes E-News, please click here to be taken to the unsubscribe page.